There’s nothing fun about having missing teeth. Such a problem can affect your smile AND your self-confidence and can also cause pain and other sorts of distress, such as eating difficulties. But, when deemed appropriate, dental implants can help restore that smile and bolster your self-confidence once again. A dental implant is a metal post (or frame) that is surgically inserted into the jawbone beneath the gum. Once properly in place, the post serves as a holder for replacement teeth. Your dentist can mount these new teeth directly onto the post(s). Sounds easy. But why does a patient need a dental implant? Dr. Mixson and the staff at Gentle Smiles Dental specialize in restorative dentistry including the use of implants, and this Atlanta dental practice uses the latest technology to make the implant procedure as pain-free as possible while achieving superior results. Endosteal implants – This type of implant involves surgical implantation directly into the jawbone. 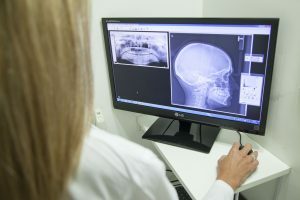 Once surrounding gum tissue has sufficiently healed, a second surgical procedure includes connecting a post to the original implant. Lastly, an artificial tooth is attached to the post. Subperiosteal implants – With this type, a metal frame is fitted onto the jawbone below the gum tissue and becomes fixed to the jawbone while the gum heals. Posts are attached to the frame and artificial teeth are mounted on the posts. Both types of implants will involve several visits to your dentist. New technology has made it easier for dentists like Dr. Mixson to show a patient the actual results of receiving dental implants before the procedure even starts! Therefore, a consultation with a qualified dentist who is taking advantage of today’s state-of-the-art tools can help the patient to understand the advantages of implants and other restorative or cosmetic procedures. At Gentle Smiles Dental, we take the time YOU need to explain the pros and cons of implants, we teach you how to care for your implants, and we’re happy to discuss ways in which we can make implants more affordable for our patients. Call our helpful staff today for more information on restoring your smile with dental implants.